What is “Long Range?” When windage and elevation become an issue with your shot, it’s long range shooting! The caliber, bullet, rifle and many other factors play into defining long range, and we work with you to get the most out of the equipment you field. Fortress staff members Angelo Novelli (Barrett .50BMG World Record Holder) and the Fortress Staff will take you through the basics of rifle set up and creating a data book, estimating wind and distance, making proper scope/sight adjustments or hold over, and engaging targets at distances from 100-yards to the performance limit of your rifle and caliber*. 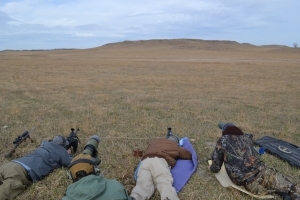 This course is offered to the individual shooter, as well as the shooter/spotter team(s). Equipment required: Rifle of your choice, chambered in a caliber capable of performance beyond 800-yards. 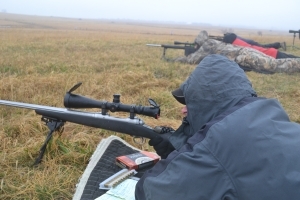 Bipod, data book, pens, spotting scope (20x power, or greater), and normal range safety equipment and dress for weather conditions. Please keep in mind that should you opt for a .22LR, 5.56mm or 7.62×39, etc., your distance options become quite limited, but we will work with what you have. It’s best to contact us for consultation should you wish to train with such calibers. Ammunition requirements: 250 to 350 rounds of factory ammunition, depending on course duration. We recommend the Federal Match ammunition for standard bolt-action rifle calibers, such as the .308, 30.06, etc., for target engagement out to 800+ yards. 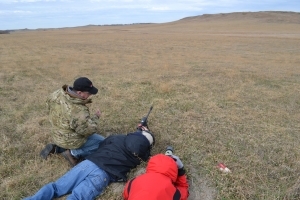 Many students prefer to handload ammunition and “tune” the load to their specific rifle. We have no problem with that, but some students have experienced problems with ammunition they load which will shoot dime-sized groups at 100-yards, yet be unable to hit anything at 800+ yards due to a lower powder charge being used. Therefore, we recommend factory ammunition or hand loading be set to factory specifications. If you prefer to use military surplus ammunition, or such, we will help you get the best performance you can get from it. We work with what you bring, but we have generally seen reloads cause more problems than they solve.